According to a press release from Los Angeles artist Matt Cornell, students at UC Berkeley were surprised to discover a new brand of toilet paper in the stalls of the law school building this morning. Cornell made a private donation of ” Yoo Toilet Paper ” protesting the tenure of controversial Bush lawyer, and author of the “torture memos,” Professor John Yoo. 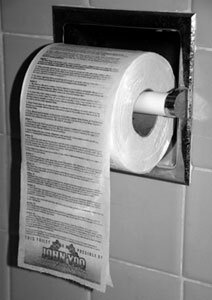 Each roll of toilet paper contains text from the United Nations Convention Against Torture, just one of the many laws that critics say Yoo violated when authorizing the use of torture against detainees. Cornell also notes that his brand of toilet paper is softer and of higher quality than that provided by cash-strapped UC Berkeley and contains “valuable reading material” for law students. The ACLU filed suit Friday in a bid to force the Justice Department to release its internal report on torture. The long-awaited report from the department’s Office of Professional Ethics considers whether DOJ lawyers like John Yoo broke ethics rules in writing the memos that approved torture. In November, Attorney General Eric Holder testified that it would likely be out by the end of the month. At that time, the department said it was going through the normal review process. In December, the ACLU had filed a FOIA request for the report. Under the Bush administration, the Office of Legal Counsel issued a series of memos intended to permit interrogators to use methods that the United States had previously described as war crimes. As a result of those memos, hundreds of prisoners were abused and tortured, and some were even killed during the course of interrogations. The public has a legitimate interest in knowing whether the authors of the memos violated ethical rules as well as the criminal laws, and in ensuring that those who wrote the memos, as well as those who authorized torture, are held accountable. The release of the ethics report is long overdue. An Italian court’s conviction of 23 CIA agents for extraordinary rendition has been hailed by human rights campaigners as a “historic repudiation” of the US intelligence agency’s crimes. The agents, including one alleged to have been a CIA station chief in Milan, were given jail sentences ranging up to eight years for the crime of kidnapping Hassan Mustafa Osama Nasr and secretly transporting him to Egypt to be tortured. Mr Nasr, also known as Abu Omar, was snatched in Milan on 17 February 2003 in a joint operation between the CIA and Italian military intelligence. WASHINGTON, Aug 14 (IPS) – The U.S. government continues to withhold even the most basic information about prisoners in the Bagram detention facility in Afghanistan, according to the American Civil Liberties Union (ACLU), a New York-based legal rights organisation. An April 2009 ACLU Freedom of Information Act (FOIA) request for documents and information about the detainment of prisoners at Bagram has yielded dead ends with both the Department of Defence (DOD) and the Central Intelligence Agency (CIA). Prison at US base in Afghanistan a sore point among Afghans.